Have you ever gone to the clinic for a mammogram to find that the gown they hand you is way too small and you are bursting out of it? I have, and it was quite distressing. Recently, I came across an ad for these patient gowns for women called Janes and she offered to send me one to review. Janes offer comfort, coverage and dignity. They are made of a lightweight waffle weave jersey material and Jane’s size 2 says that they will fit a roomy 4X, but I think a 5X could easily wear one. I am a standard size 26-28 and I am quite large in the torso, belly and chest. In the photo above I have the external and internal strings that attach it tied as tightly as they will go, and there is a ton of room in the shoulders and arms. I think by just loosening the strings the gown could fit a larger size because there was a lot of internal fabric that I was not using by tying it so tightly. Take a Jane to your next mammogram appointment or give one as a gift to a friend who is in the hospital. Janes come in a sweet cinch bag and can be monogrammed. They cost $32.00 and make a great girlfriend gift. 2% of the profits for Janes funds free mammograms for under served women. This entry was posted in How Does It Fit? and tagged 4x medical gown, 4X plus size medical gown, 5x medical gown, plus size 4X hospital gown by affatshionista. Bookmark the permalink. Sharon: The gowns are lovely and very large. I hope they fly off the shelves. That is such a good idea. 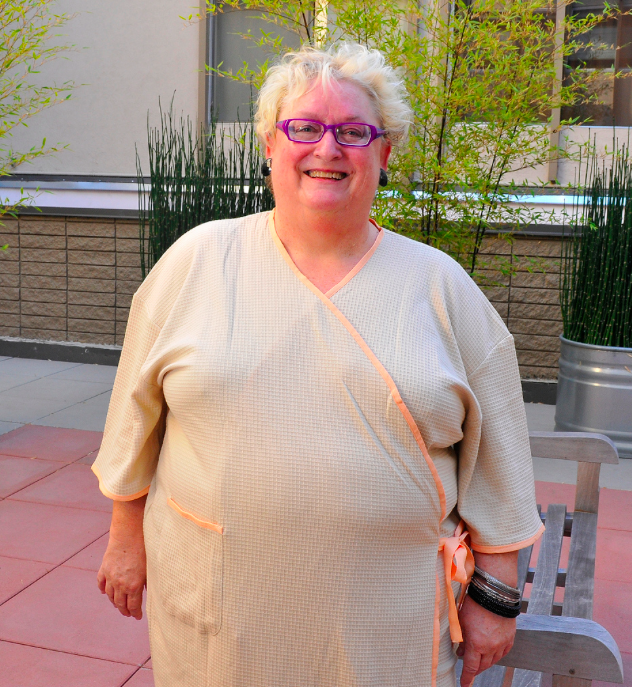 Here in the UK they make fat people (at least in MY experience) wear two gowns, which is equally as embarassing. It’s good to hear someone is thinking of fat people like this. Thanks for commenting Leah. I do not think I have tried 2 gowns, but it would be better than my “bits” hanging out, but yes I agree, embarrassing, in what is already an awkward moment. such a GOOD IDEA !! LOOKS WAY MORE comfortable then the thin cold over washed and used gowns. would look really cool monogrammed too! You’d hope that when they doubled the price – they’re now $67 a piece – that they’d have started giving more than just 2% to worthy causes. But not so, according to their website. What’s odd is that now they have a separate plus-size gown, that is sized as 4X-16X, and it’s the same price as the regular gown. Normally I’d applaud them not charging a ridiculously higher amount for the plus-size than the materials and labor would warrant charging. But if it really does fit people up to 16X, that’s a lot of material to not be charging more. And then there’s the 6X person who’s going to have to have the 4X-16X style altered to fit them, making it probably cheaper to have a custom-made one off of Etsy. Why does it feel like, whenever a company is showing any respect for the plus-size market, it only lasts a few years, and then suddenly their practices are mirroring the big chains?